I’ve observed several things this trip, some of which have been at odds with other places I’ve visited in the US or have struck me as strange in some way. None are good or bad — they are just observations. I’ll add to this list as I notice other things. There are a surprising number of recent deer kills on the sides of the interstate highways. 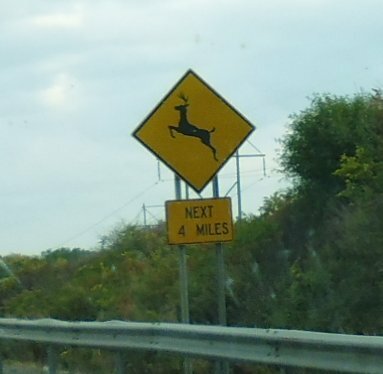 There are quite a few deer signs, but neither the deer nor the car comes out of it well if hit at 70 mph. For most, the dead deer is intact at the side of the road, but one was like a scene from a horror movie with great chunks of red meat strewn all over one lane — I expect a truck hit it or ran over it. There’s also quite a lot of raccoon and opossum road kill. There are very few billboards on I-90 (unlike in Arizona, Texas etc.). In fact, I’d almost say there have been none in the states I’ve driven across, except for a patch on some Native American land (the billboards for the casino were a giveaway). The light between 8 and 9 am and between 5 and 6 pm is just magical for taking photos, assuming the sun’s shining. There’s a real soft golden glow. There are a surprising amount of agricultural pursuits visible from the road, and surprisingly little urban sprawl. I’ve seen fields of corn, soybeans, wheat, and wine grapes, with some being harvested now. Considering I’ve driven over/around/through Toledo, Cleveland, Buffalo, and Rochester, I’ve seen no evidence of urban sprawl like you see in California or in Australia. In fact, it’s all quite rural and bucolic as you’re driving by on the interstates (I-90 was the main one I’ve been on). Update: Same for the other New England states; even four miles from a state capital, the scenery was rural. In the middle of ‘suburbia’ in Fairport (near Rochester, NY) there’s a working farm! With cattle and sheep and goats all grazing on grass. It seems it’s heritage listed and cannot be developed and is part of the green belt. Awesome! Exit numbers on I-90 are sequential, whereas (from memory) those on the west coast are based on the number of miles from the border. Update: Same for the interstates in Vermont and New Hampshire. 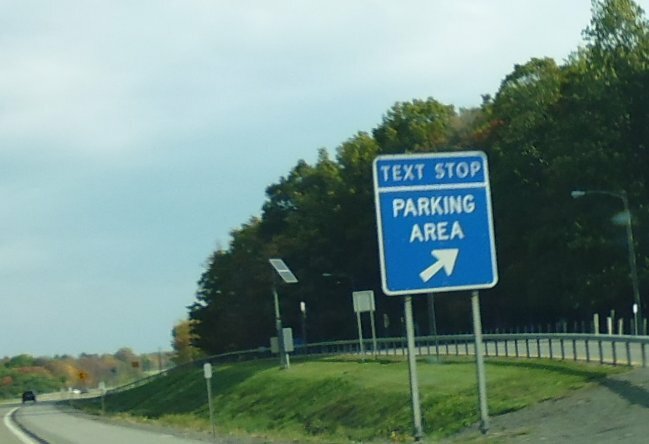 New York state has ‘Text Stop’ places on the interstate, in addition to the service centres. Ohio has lit messages over the interstate saying that some 120 teens have been killed this year alone, and to save the LOLs and OMGs until you stop. Hotel air conditioning units — they’re either too hot or too cold, or if you can get the temp just right, the fan is so loud you have to wear ear plugs… even on ‘low’. If you turn it off, you no longer have a/c. The ones in your house don’t make this much noise, so why do they in hotel rooms? Beware the a/c in cars in the US! I got caught — I turned on the heating/cooling, adjusted the temp down, but it was still warm and humid in the car. Eventually I found the ‘snowflake’ button and suddenly I had delightful a/c. 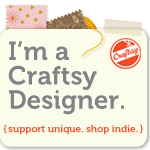 In the process of finding it, I tried all sorts of pushing, pulling, and turning of the various knobs. One knob had 3 dots on it, so I pushed it in and the 3 dots lit up. Maybe that was the a/c? No. It was the car seat heaters!!!! I nearly burned my backside. A 113 g (4 oz) tub of low fat yoghurt had 16 g of sugar in it!!!!! Unbelievable. Most drivers drive with their headlights on all the time, which is good. Some states require you to turn your headlights on if you are using your windscreen wipers. Most of the interstates I’ve been on (90, 87, 89, 93 so far) are only two lanes, except in built-up areas around major cities. Merging is good — long merging lanes, merging traffic gets up to speed to merge, other drivers move over to let them in. I’ve seen no evidence of any sort of road rage. Drivers keep the the right (keep to the left would be the equivalent in Australia), and it just works. You only go into the other lane to pass; people don’t hog the passing lane. Some radio stations display the artist and song they’re currently playing on the dashboard screen, which is handy if you like a song. Interstates are designed for long-distance travellers — they have rest areas, info centers, service plazas, and signpost how far to the next one. All highways and most roads are numbered, which is darned useful for travellers. No need to look for a local road name or locality that you’re not familiar with. I live in the states and never knew this! That is awesome! We have kangaroos and emus here. Emus do more damage if hit, but there’s more chance of hitting a ‘roo. So far I never have, but like a deer, they do a LOT of damage to your car, themselves, and the driver’s mental state.